Ever felt unsure of where your style lies? Maybe you love your traditional home but desire a bit of contemporary flair with your home decor. Not sure if you can fully commit to a sleek, modern look but want to move beyond the old ways of traditional styling? Behold transitional style. A beautiful blend of contemporary and traditional designs, transitional style is the perfect combination of old and new. Traditional style is all about ornate and elaborate details while contemporary style highlights sleek, minimal lines and styled spaces. 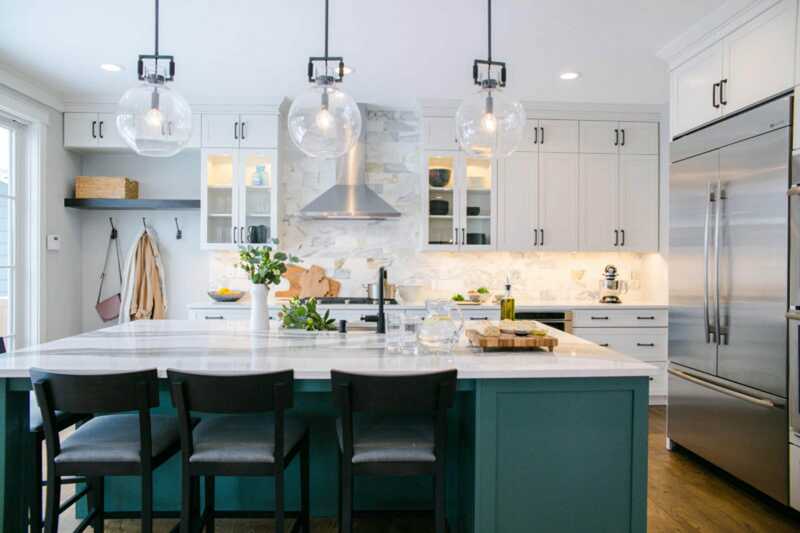 Not subject to one defining factor, transitional style highlights a multitude of traditional and contemporary pieces expressed through colors, fabrics appliances, tile, furnishings and decor. Featured: Meram Blanc Tumbled. Design by Alegria Homes. While most tiles are not particularly “transitional” in their own right, tile can accentuate the already transitional style. Mix traditional tiles, such as certain mosaics or a classic marble, with contemporary ones, like large-format tiles, to get the best of both worlds. 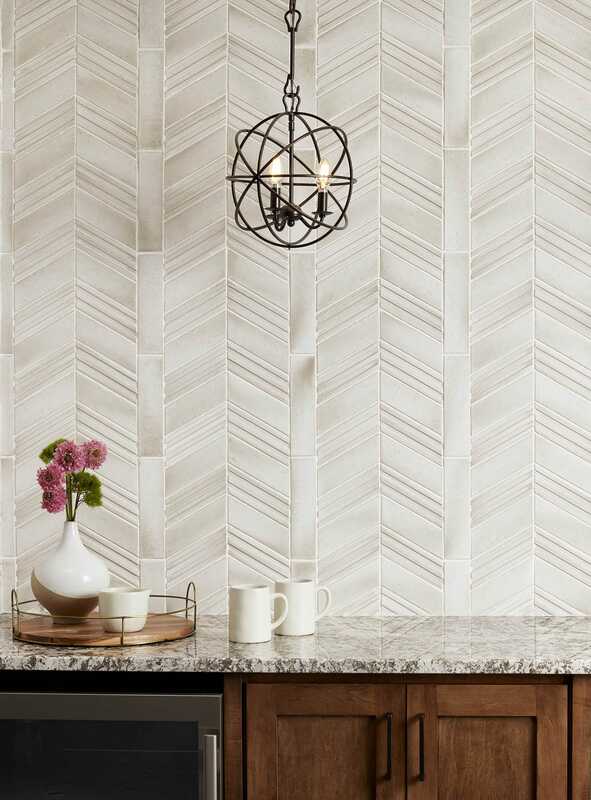 The tile pattern you choose can also attribute to transitional style, such as using vertical or horizontal stacked tile for a contemporary look. Transitional style can be many things! This flexible style is a very popular option for the mixing of long-established design trends and fresh new designs. Keep scrolling for some beautiful examples of our favorite transitional home designs and tile features. This clean kitchen design by Timber Trails DC perfectly achieves transitional style. Check out the traditional cabinetry featuring raised panel details paired with sleek, straight drawer pulls. The stainless steel appliances and lights give way to a modern look compared to the traditional decorations on the countertops. 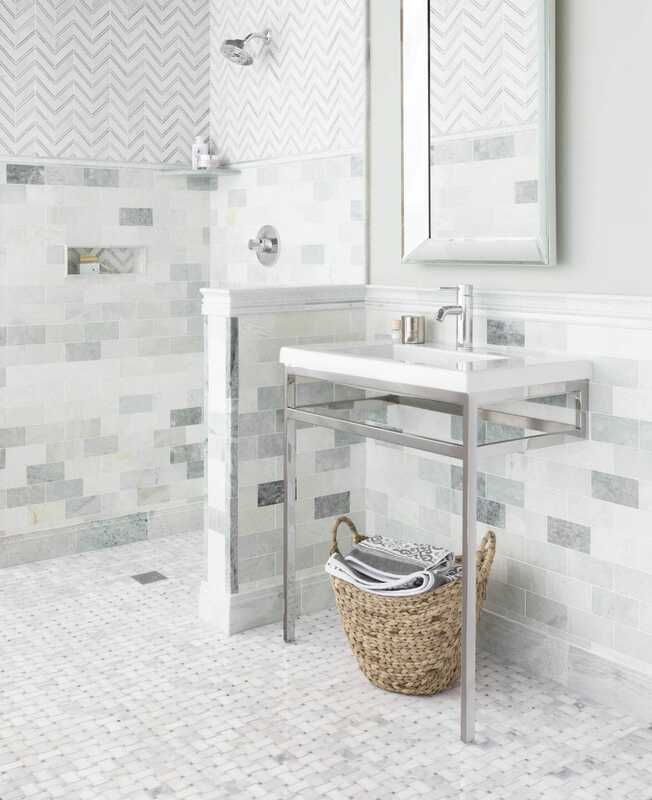 The clean chevron tile pattern draws interest. 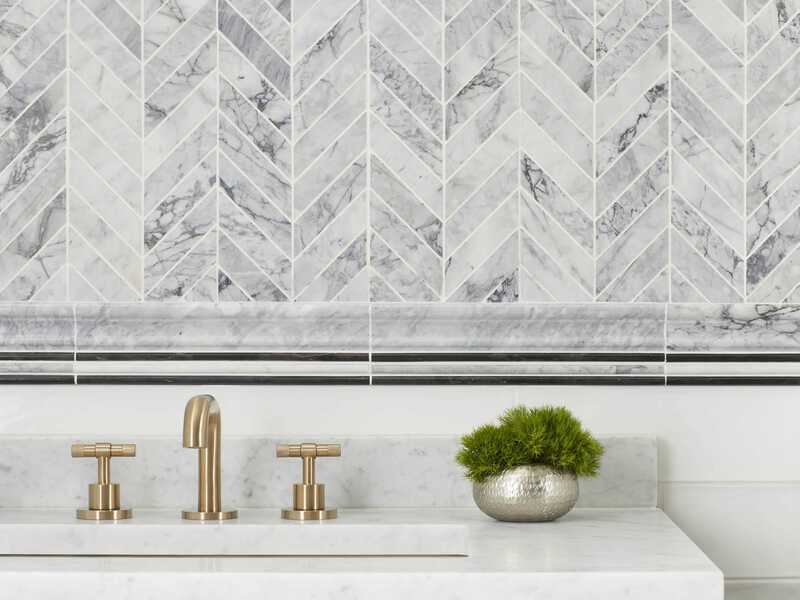 Featured: Hampton Carrara Polished Chevron Marble Mosaic. Design by Timber Trails DC. Photography by Stoffer Photography Interiors. 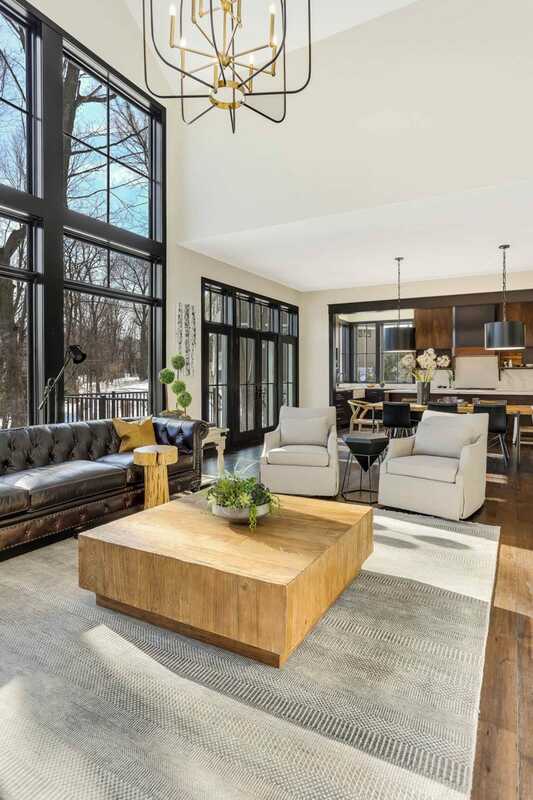 The renovation below by The Kingston Group displays an elegant gold mirror with ornate details, and in the background a contemporary couch with clean lines and a narrow table complete this transitional space. The classic marble checkerboard pattern is traditional in its own right, utilizing tile patterns to achieve transitional style. 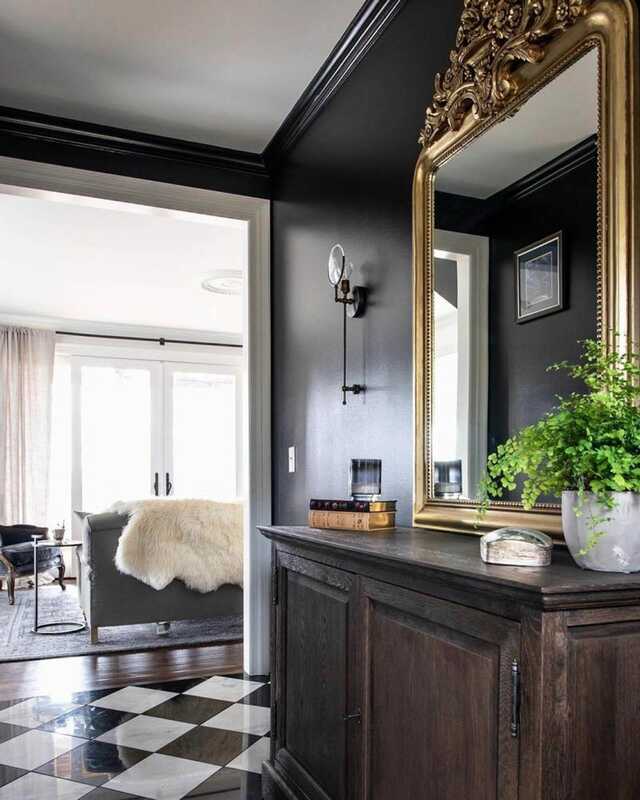 Featured: Black Marquina, Hampton Carrara. Design by The Kingston Group. Photography by Visible Style. Layered trim pieces create the effect of a traditional wainscot in this bathroom, seamlessly transitioning from tile to a painted surface. The trim pairs nicely with the classic basketweave mosaic floor tile and the contemporary wall-mounted console. Here is a closer look at using layering pieces to transition. This bright kitchen’s range hood and cabinetry are traditional, while the handles and sconces are contemporary. 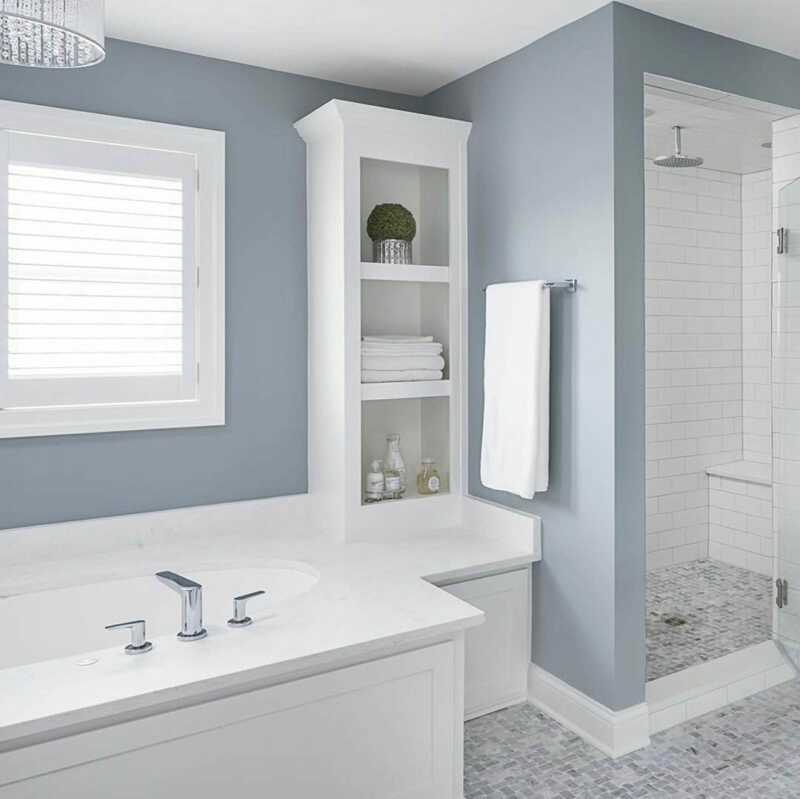 A white subway tile pairs well with any style, and transitional is no different! Featured: Imperial Bianco Gloss. Design by Alma Homes. Photography by Oho Interiors. A Chesterfield couch next to a one-of-a-kind contemporary light fixture balances transitional style. We also love the clean, straight lines of the contemporary wood table. Design by West Bay Homes. Photography by Twin City Visions. 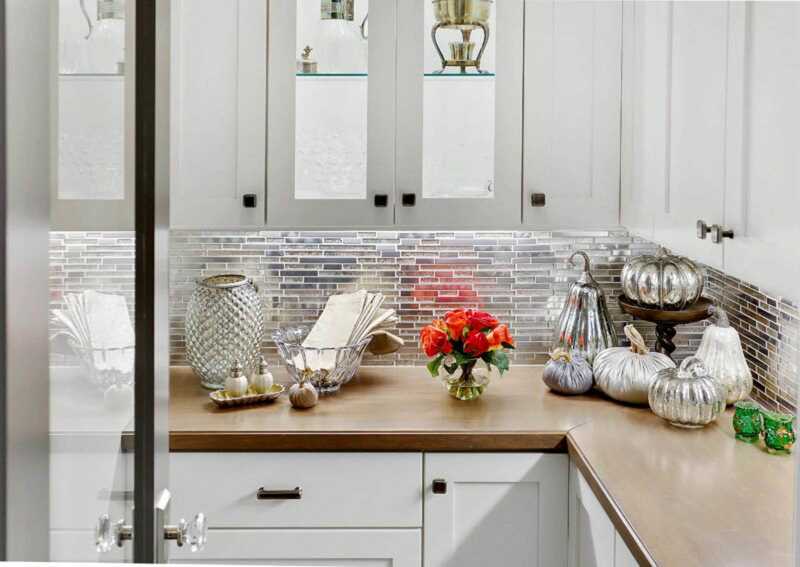 Mix and match a contemporary glass mosaic backsplash with traditional cabinetry to create a transitional kitchen space. Featured: Daytona Beach Mix Metal Mosaic Design by West Bay Homes. Photography by Twin City Visions. This delightfully bright and airy kitchen merges old and new world. 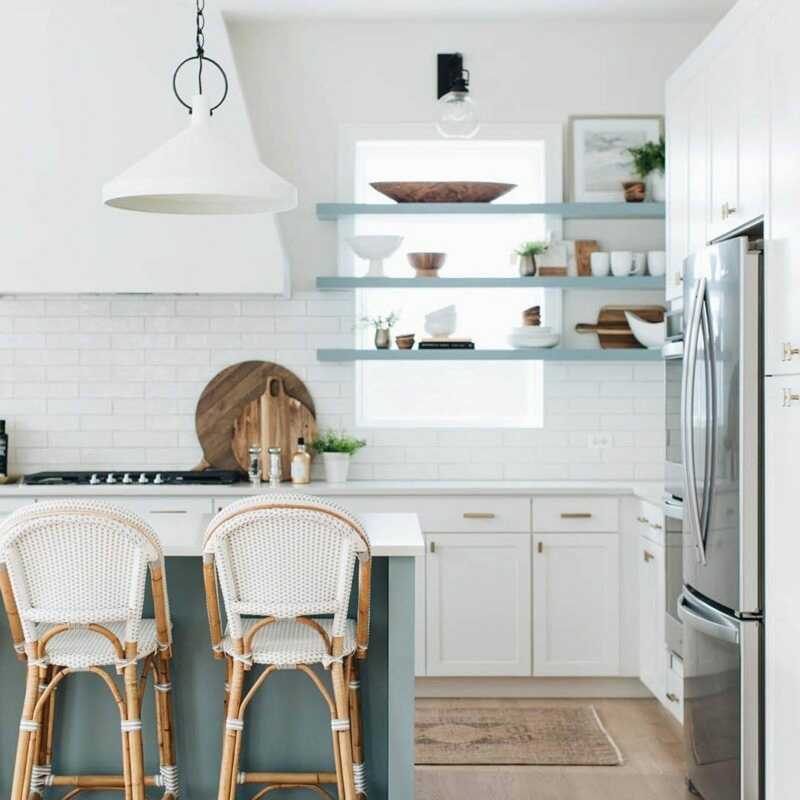 We adore the handmade-look subway tile and mix of open shelving and closed cabinetry. The natural elements in this space and mixing of metals, from the hardware to the stainless appliances and matte black details, add the finishing transitional elements. Featured: Retro Lino. Design by Timber Trails DC. Photography by Stoffer Photography Interiors. 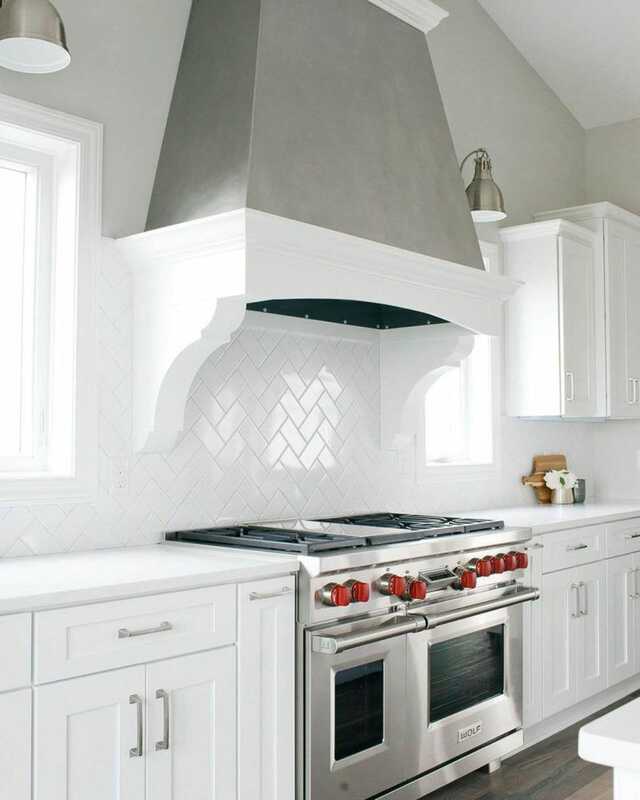 Run subway tile in a vertical straight stack instead of horizontal for a modern take on subway tile. The traditional chandelier and warm wood cabinets complement the contemporary tile in this calm-yet-cool space. The combination of the Shaker-style cabinetry, contemporary lights and a sleek countertop have us feeling the transitional vibes. Don’t be afraid to add a pop of color to your space. Featured: Firenze Calacatta. Design by TVL Creative. We love a soothing bathroom. Let go of your style worries and settle into whatever it is you find beautiful. With transitional style, you don’t have to choose. This timeless room is paired with sleek faucetry and a shower head, making this room truly transitional. Featured: Ashford Carrara Polished Niles With White Dot, Imperial Bianco Gloss. Design by Chad Esslinger Design. Photography by Picture Perfect House. 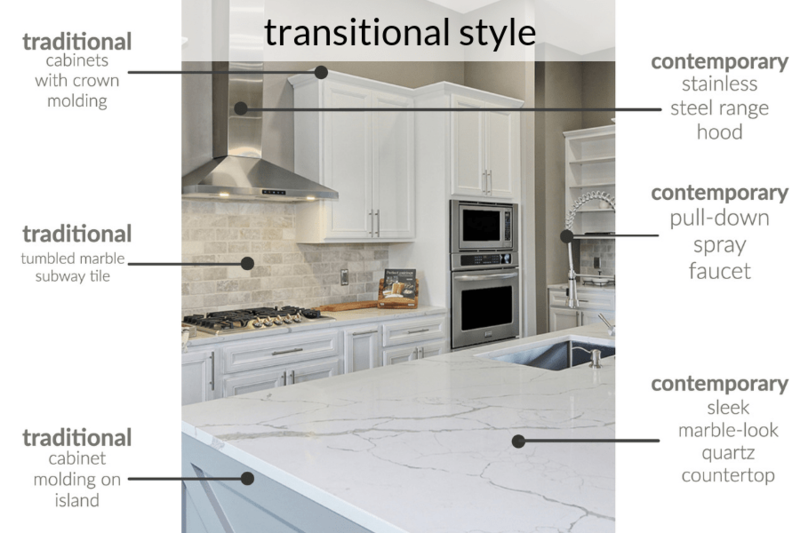 As you can see, there are a lot of ways to do transitional style beautifully. Inspired by these gorgeous transitional spaces? Learn how you can improve your space to suit your style with a free design consultation and find more transitional spaces with a Pinterest board just for you. Visit our Transitional Style page for more inspiration.